I often get asked, “Where are you putting all those things you buy?”. Enter my friend, Shelfie. Shelves have evolved past holding only the necessities to really becoming a focal point for design. They are a great way to organize and display your collected treasures, while also adding a lot of character to a space. I am going to show you how I transformed my mom’s living room by adding shelves and then also provide some shelfie styling tips so that your shelves look intentional and cohesive. The space I had to work with was very long and narrow, so customization was key to achieve that “built-in” look. I teamed up with Shelfology and was able to easily customize the length and depth online, and I can honestly say I am so impressed with the quality. I chose Shelfology’s Aksel Floating Shelf System which comes with the brackets and shelves, and was very easy to install. The shelves are 2 inches thick, giving that substantial impact I was looking for. 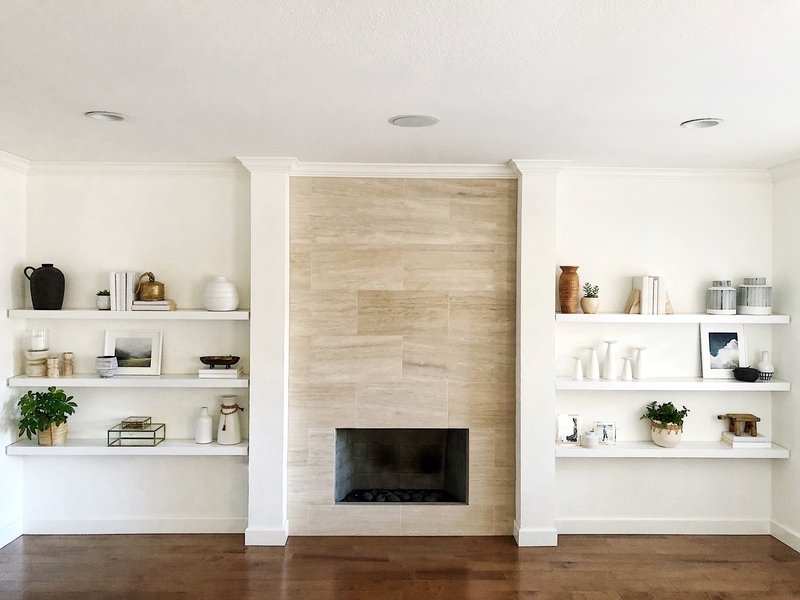 While I love natural wood color shelves (and they offer a beautiful selection of them), ultimately I chose Shelfology’s painted white shelves for my mom’s space since it fit the color scheme better. Here’s a look at the brackets that attach to the wall and then how the shelf slides on them. I liked the balance of three shelves on either side and decided to space them towards the lower half of the wall so that we had room on top to hang artwork or even add lighting. The added shelves instantly made the room feel larger! It’s amazing how adding the right things to a space can visually increase its size. How Far Apart Should I Hang Them? Starting with books is almost like making your bed before you add the pillows and throws. You create a nice base, so that your other items can shine. So I grouped a few books together and put them on most of the shelves, laying them flat or standing them up for variety. I was so happy when I found fabric covered books from Elements by Amber because it took all the guesswork (and footwork!) out of finding sets that were in the same color family. She also has non-fabric covered books (titles on the spines) grouped beautifully and ready to go. I suggest picking two or three colors and sticking to that color scheme to help make things feel cohesive. Woods, metals, ceramics, glass, clear and opaque! Having a nice mix so that everything doesn’t feel one note can help create interest. I use to think the bolder and brighter, the better! But since shelfies have to compliment each other as well as the room they are in, strategically picking what items you want to showcase (whether it be an unusually shaped object or a pop of pattern) helps gel things together. They say to design in odd numbers and I have found that working with groups of three is a nice start. I like to use items of varying height (propping a book underneath an item to give it some height works nicely too). TIP: Repeating an item helps fill in large spaces and gives the eye a rest. Artwork is not just for gallery walls. Artwork can be displayed on the shelves or even hung in between the shelves, adding character without overwhelming the space and feeling knick-knacky. For landscape artwork, I am obsessed with Sarah C. Nightingale who offers both originals and prints and whose work has this vintage feel about it. For portrait-like artwork, I recently found Clare Elsaesser who has an amazing collection. Plants (faux or real) are ALWAYS a good addition. I am making over my mom’s whole living room in stages so stayed tuned, but these shelves have already transformed the space! Ah, I love this, it really came together well. Giving me lots of inspiration to style my own build-in’s. This turned out so incredible, Erin! Your shelfie game is out of this world. Hi Jennifer! Thank you so much for the compliment. It is a tile from Arizona tile.